In 2017, the Finker-Frenkel Family Foundation was awarded the Philanthropist of the Year Award at Make-A-Wish America’s Conference. Shareef Malnik, the board chair for the Make-A-Wish Southern Florida Board of Directors presented the award to Dr. Lazar Finker and Eugene Frenkel at the 2017 National Conference. Donors help make up the backbone of all Make-A-Wish does and it is only through their help and the help of volunteers that we can continue toward our goal of granting the wish of every eligible child. The Finker-Frenkel Family has played an important role in the success of the organization over the past several years. The Finker-Frenkel Family Foundation through the efforts of the Finker-Frenkel Family (Eugene and Brooke Frenkel, and Eugene’s parents Lazar and Raissa), are wholehearted supporters of making wishes come true. Four years ago, the family joined the Chairman’s Challenge Society, an elite group of supporters who pledged $25,000 a year for five years to help underwrite the cost of putting on the InterContinental Miami Make-A-Wish Ball. Three years ago, Eugene joined the Make-A-Wish Southern Florida Board of Directors. Eugene and Brooke have made supporting Make-A-Wish a family, foundation and corporate priority. The Finker-Frenkel Family Foundation, and its affiliations have sponsored the entertainment at the Ball for three consecutive years, bringing us Marc Anthony, John Legend and Lenny Kravitz. The Finker-Frenkel Family Foundation was our 2016 Foundation of the Year. Eugene’s company, Legacy WealthAdvisors, is also a generous supporter of Make-A-Wish Southern Florida. The Finker-Frenkel Family Foundation made the largest gift in Southern Florida’s history with a $6,000,000 pledge to our Endowment and Capital Campaign and naming our future Wish House. In all, the Finker-Frenkel Family Foundation, the family personally, and their company have committed more than $6.8 million to Make-A-Wish Southern Florida. 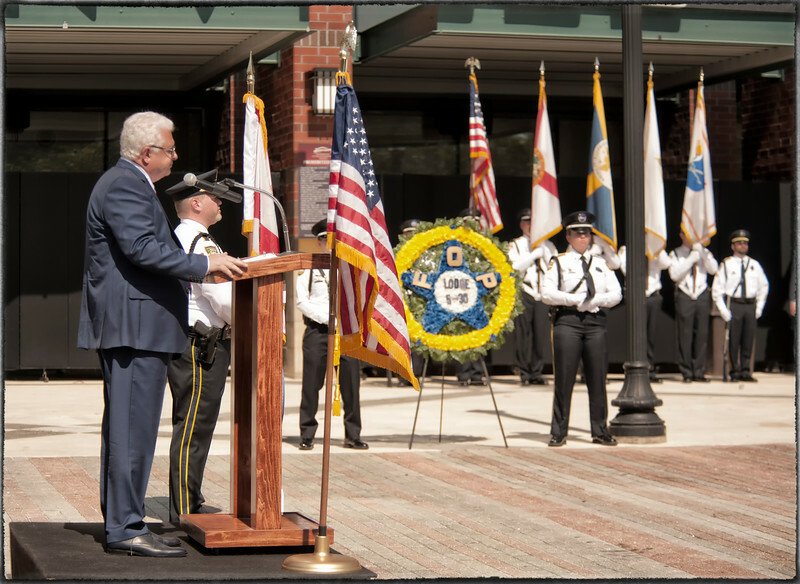 FORT LAUDERDALE, Fla., May 10, 2018 /PRNewswire/ — The Finker Frenkel Family Foundation, a family-run foundation, donated the funding to honor the memory of the 61 police officers that have been killed in the past 178 years in Jacksonville, Florida. The donation allowed for the creation of three new statues, a granite wall, and an eternal flame. The statues flank the black granite memorial wall containing the names of the fallen officers’ engraved for all to see. The original idea for a memorial Wall was brought to the Finker Frenkel foundation by Eagle Scout Adam Resch. 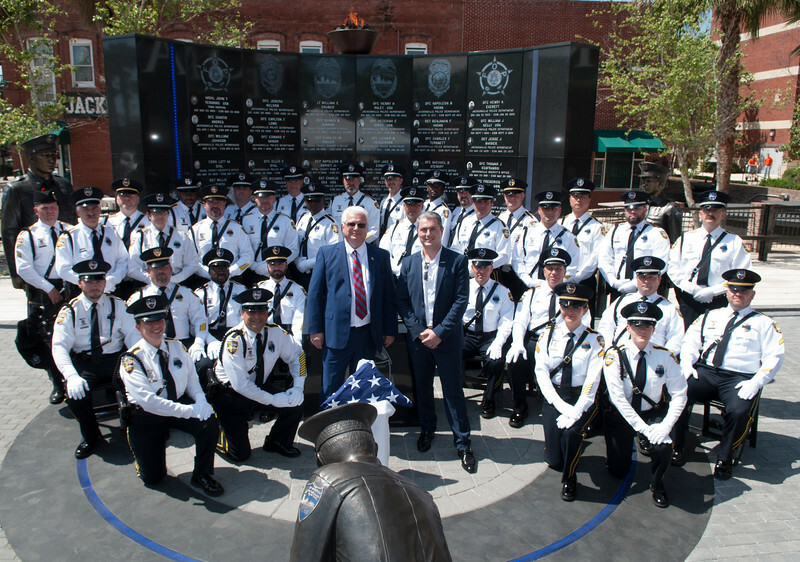 The new statues include two officers standing on either side of the curved wall while another depicts an officer kneeling in front of it, placing a red rose near the blue line that encircles the memorial in a semblance of paying tribute to those who have given their lives in the line of duty. There is also a new granite cube thanking the Finker-Frenkel Family Foundation for the donation and a kiosk with information about the memorial. An article on Jacksonville.com noted that some 200 family members of the fallen attended the ceremony. During the ceremony, officer Mike Richardson read a roll call of the 61 names on the wall, which was followed by a Flag Fold Presentation and “Twenty-One Gun Salute” by the Jacksonville Sheriffs Office Honor Guard. A “Missing Man” flyover was conducted by the Jacksonville Sheriffs Office Aviation Unit. 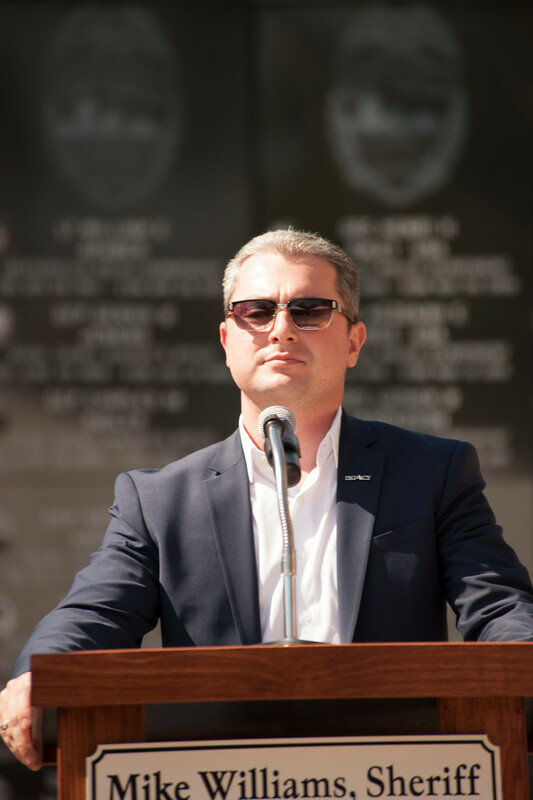 Dr. Lazar Finker and Eugene Frenkel from the foundation spoke at the ceremony, paying tribute to the fallen soldiers and thanking the men, women and families who serve our communities. As a philanthropist, most of the time you are actively pursuing your mission of making a positive change in the world and the lives of others but every once in a while, life will present you with an unexpected opportunity to do just that and it will align perfectly with your vision. Serendipitously, this occurred for Eugene Frenkel (Director, Finker-Frenkel Foundation) when he read an article about Sophia Victoria, a young girl with cerebral palsy, who had reached out via social media in hopes of finding someone who may have captured an incredible moment in her life when her biggest idol, Dierk Bentley, had approached her and held her hand for a moment during a show she attended. Eugene was planning a birthday surprise for his wife, a big Dierks Bentley fan, to meet the performer which was made possible through his and the Finker-Frenkel Family Foundations support of Dierks charity “Miles and Music” benefitting Vanderbilt children’s hospital. After reading the article, and feeling that this had been placed in his path for a reason he reached out to Sophia Victoria’s mother….. Full article and inspirational video below…..
Last week US99.5 ran an article on Sophia Victoria, a Dierks Bentley fan who was pleading for help via social media. Sophia attended Dierks’ Sounds of Summer tour on July 9 in Virginia Beach and had an incredible moment when the singer approached her and held her hand for a moment during the show. Needless to say, she wishes she had a photo of the moment! However, Sophia has cerebral palsy, which causes her to shake. And when Dierks grabbed her in the audience, she wasn’t able to take a photo (she also suffers from memory loss, another reason why she really wanted a photo). We wrote about the story last month; perhaps you read it. But we’re really grateful that one person who did read it was Eugene Frenkel. Frenkel is a South Florida entrepreneur and philanthropist who was planning a birthday surprise for his wife, a big Dierks Bentley fan. That surprise was an acoustic performance and lunch with, Dierks Bentley himself. Mr. Frenkel told us, via email, that “I was able to accomplish this by supporting Dierks and his Miles and Music charity event benefitting Vanderbilt children’s hospital, which is in line with the vision of our family foundation, The Finker-Frenkel Family Foundation. The thing is, Frenkel isn’t a big country music fan, so naturally, he did some research on the singer. And guess whose article he found online while he was doing his research: “I came across your piece, and the story about how [Sophia] was not able to capture a very special moment in her life. I believe that since I couldn’t help Sophia find this picture, we could make a new one!” And so he started working on recreating Sophia’s big moment. Apparently Sophia’s mother thought the situation was too good to be true. And yes, Sophia now has a wealth of photos of herself, Dierks Bentley and her new special friend, Eugene Frenkel. Check out the photos below, and watch the video of the magical reunion above.